Originally the cream-crowdie would have been made with the Highland crowdie – a type of cheese. This is hard to get hold of now, so these days it’s usually made with double (or heavy/whipping) cream. This cream-crowdie was called stapag in the Highlands, or pram in Shetland,6 and it forms the basis of a popular Scottish dessert known as cranachan. 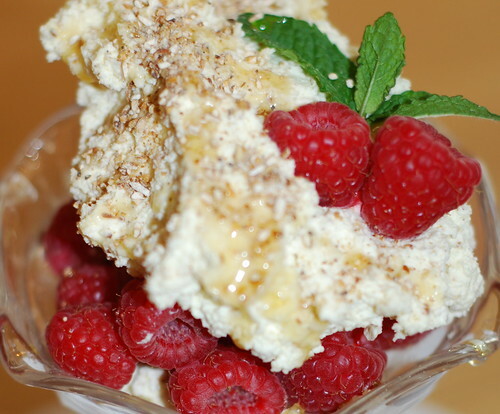 Recipes for cranachan vary slightly, but they invariably include the cream-crowdie with either sugar or honey mixed in along with other flavourings, and then layered with raspberries. The following recipe should be taken as a guideline, really; you can use as much cream, raspberry and honey as your tastebuds decide and there’s a lot of room to experiment with it. Shortbread or gingerbread compliment the cream, honey and raspberries nicely, but you could also try it with the Yetholm or Pitcaithly bannocks if you want to incorporate the festival bannocks into the proceedings. While the recipe works well for Samhainn divination, the cream-crowdie was also traditionally served at harvest-time,7 making it ideal for Lùnastal when the raspberries are at their freshest, and really it can be served at any festival now that raspberries can be bought all year round. I tend to make individual portions so I can add the whisky for the adult portions and leave it out for the children’s, but it works well as a communal dish for a Samhainn party as part of the divination and then you might want to leave the whisky out altogether to accommodate children or designated drivers/non-drinkers. It’s more fun to compete for the charms than it is to just pick a serving off a tray, and if you make single servings and there are more charms than people you’re going to have to decide whether to put the charms in randomly for each portion until you have enough to go round, or else make enough portions to use each charm so everyone has a chance to choose from all of the charms, and then have leftovers (they probably won’t go to waste, to be fair…). The following recipe is for cranachan, which can be made just as a festive dessert or for the divination (the raspberries getting all mushed up as everyone digs for charms will look very in keeping with the Hallowe’en theme in a dimly lit room, anyway…); if you prefer to just make the traditional cream-crowdie for a Samhainn party, then the cream and oats can be thrown together just before you need them and everyone can help in some way – helping to whip the cream, sing, toast the oats, or add the charms and mix it all up (deiseal). A little honey helps to sweeten, but it’s entirely optional. Otherwise, allow plenty of time for the flavours to infuse when making the cranachan, especially if you’re adding whisky or liqueur. The amounts given below should make enough for about six people as a dessert on its own, but it will go much further if you prefer it as a compliment to some shortbread or gingerbread, depending on how you want to serve it. The picture below shows a chocolate mousse with the raspberries and cranachan on top, and served with a chocolate chip shortbread on the side. 1. Whisk the cream until it’s stiff and fold in the honey and whisky (if using). 2. Toast the oatmeal in a heavy pan and mix half of it into the cream, leaving the rest to sprinkle on top. 3. Pile the cream on top of the raspberries in a trifle dish, or if you want to be fancy you can layer the raspberries and cream alternately in individual serving glasses, drizzling a little extra honey onto the cream with each layer, or swirling some honey around the edges of each glass or bowl. 4. Poke the charms into the cream, if using; one for each serving glass, or evenly spaced in the large dish and then smooth off the top to hide where you put them. 5. Try sprinkling some chocolate chips or drizzling melted chocolate on top, and/or some extra honey. 6. Leave in the fridge for the flavours to infuse for a few hours – this is especially important if you use whisky in the cream. 7. When you’re ready to serve, sprinkle the remaining oatmeal on top. 8. Garnish and serve with the shortbread or gingerbread, if using. The gingerbread can be crunched up and sprinkled on along with the oatmeal, if desired. Non-alcoholic flavourings can be added, like vanilla, if you prefer, or else mead is a good substitute if you don’t like whisky. Gingerbread would be particularly appropriate if serving at Samhainn, and compliments the raspberries nicely. The basic recipe for shortbread is a 3:2:1 ratio of flour, butter then sugar, respectively, so it’s very easy to make more or less. An egg is sometimes added for a richer flavour (as in the case of the Yetholm bannocks), various flavours can be added – from vanilla and ground almonds, to chocolate chips to the more traditional caraway seeds that were often used in festive cakes. 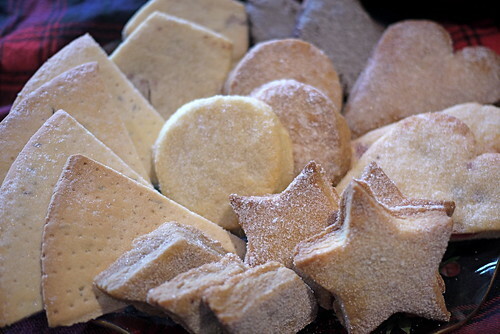 Using a darker sugar – demerera rather than white sugar, for example, will give a richer, heavier flavour and give you butterscotch shortbread instead. My favourite is chocolate chip with a little vanilla essence and ground almonds added (the almonds add to the texture more than taste). 1. Cover a couple of baking trays with greaseproof paper or tin foil. 2. Pre-heat the oven to 160ºC. 3. Cream the butter, sugar and vanilla together until it’s all mixed in evenly. 4. Mix in the flour and work into a dough – be careful not to overwork the dough, as this will affect the texture and quality of the shortbread when its baked. If your butter is very soft, you can leave the dough in the fridge for half an hour or so before working it again. 5. Roll out the dough and cut out the biscuits – whatever shape, size or thickness you like. Don’t make the dough too thick, though – about half an inch is enough. For petticoat tails (large, round and thin shortbread that’s generally decorated with a fork for pricking the dough, and then scored into eighths to make it easier to break up), roll the dough out thinly to about 1/4 inch thick and use a side dish-sized plate to cut out into a round. Score the dough into eight segments and then prick with a fork all over – or make whatever pattern you like. 6. Place the shortbread onto baking trays and sprinkle some extra sugar evenly over the top of each round or finger. 7. Baking time will depend on the size of the shortbread and how well-done you like them. Traditionally they’re supposed to be well-cooked and well-browned on top, but these days it’s more usual to buy them lightly cooked with almost no browning on top. Allow about 15 minutes for lightly cooked, thickly cut individual shortbread, then, and around 20 minutes or so for the larger but thinly cut rounds, or until the tops are just starting to turn golden. 8. Leave to cool – they’ll be quite soft if you try them straight out of the oven, but they’ll harden off as they cool. For added texture, substitute one ounce (2 tablespoons) of the flour with 4 tablespoons of ground almonds. Alternatively, substitute a quarter of the flour used with rice flour, ground rice or semolina (semolina will give very coarse, crumbly texture). To add chocolate chips or chunks, just work in however much you want into the dough – being careful not to overwork it. For a festive shortbread – based on the bride’s bun used at weddings on Shetland – try adding half a teaspoon of caraway seeds to the basic recipe given, and add a little milk as you work the ingredients into a dough to soften it slightly. Shape into a large round and quarter like a bannock and sprinkle with sugar. It was supposed to be made by a ‘wise matron’ and a piece was then broken over the head of the bride as she entered her marital home for the first time, for a prosperous marriage and lots of children. Portions were then given out to unmarried guests and they were supposed to be put under the pillow to encourage dreams of their future spouse. (See Festival bannocks and caudle: Other occasions). Skeachan is a type of ‘treacle ale’, made with black treacle or molasses and then flavoured with hops or ginger. It was traditionally a popular drink during the Yule season. 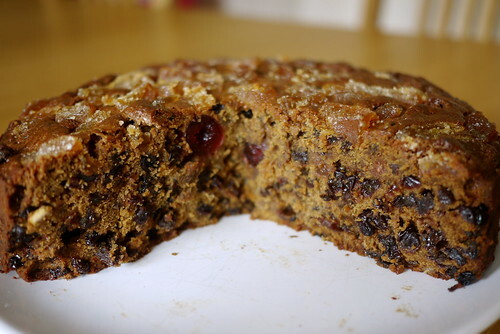 This cake recipe incorporates the black treacle, ale and ginger flavours, giving it the name. It’s also sometimes known simple as ‘treacle ale cake’. The black treacle and dark brown muscovado sugar give the cake a rich flavour and the fruit is soaked in ale making them juicy and moist – a heavy, slightly sweet ale works best, I think, but you can experiment and see what works best for your tastebuds. Golden syrup and a lighter kind of sugar also work well if you want something a little less heavy in taste. Whatever you choose, this is a good cake for festive occasions and it can make a good alternative to a black bun if you want to make something a little less fiddly. Like any fruit cake it will keep for ages, and will mature nicely. I cook by weights, but I’ve tried to adapt the recipe here to volumes as well. Bear in mind that I’ve rounded everything up to the nearest quarter cup for the sake of ease; the exact volume to weight ratios are a little less, but that shouldn’t make much difference overall. You can easily adjust the ratios of dried fruit if you prefer (I like to use more sultanas and raisins, and a little less currant and peel), as well as the amount of ginger you use. I use quite a lot to give a fiery kick to it, but you might want to add it gradually to see how you prefer it. I’ve outlined the traditional method of combining the ingredients below, but you can get good results by just putting the ingredients for the cake batter altogether in a mixer, and then just stir in the fruit. For a non-alcoholic version I think soaking the dried fruit in a flat ginger beer or cordial could work, adapting the amount of dried ginger needed for the cake batter. 1. Soak the raisins, sultanas, currants and citrus peel in the ale for at least 24 hours, stirring occasionally. 2. Preheat the oven to 160ºC (adjust for a fan oven – about 10C less) and grease a large cake tin. 4. Beat in the treacle, followed by the eggs. 5. Mix in the flour and spices (to taste). 6. Stir in the soaked fruits and the cherries. 7. Pile the mixture into the cake tin and cover the top with the crystallised ginger, using scissors to cut it to the desired thickness. 8. Bake for about 2 1/2 hours, or until cooked. 9. Allow to cool, then enjoy. Goes nicely with a little bit of cranachan. Stovies are a good, stodgy, filling dish, perfect for a cold winter night – and a family favourite. As a typical winter dish, it makes a good Samhainn dinner if you’re looking for something a little different from the usual roast or stew. Because meat was a rare treat for many folks, older recipes tend to simply consist of potato, onion and dripping (with seasoning) – the dripping giving it flavour – with mutton being the usual meat of choice if any was available. In the last century or so, lamb or beef mince have become a staple ingredient, but these days a meat substitute can easily be used if you prefer a vegetarian option (though you’ll lose a lot of the flavour, I’d recommend using a vegetable stock instead of just water). Each ingredient is added in a layer and then stewed in water (or stock if you prefer), disturbing the layers as little as possible. The quantities of ingredients you want to add are entirely up to you, and you can also choose to use either lamb or beef mince (both work equally well). Aim to have enough onion, potato and mince to make a good layer (or two) in the pan you’re using. Traditionally, the meat is supposed to have a high fat content, giving the dish that great flavour, but I’ve had good results using a lean steak mince; you can boil the potatoes before adding them to the dish if you like them very mushy and you’re short on cooking time – chop them small for very mushy, larger for not so mushy, or do different sizes for different layers to give texture and stodge – but generally stovies taste best when they’re well stewed, so try to make them the night before to let the flavours come out. A little salt is a must for this dish, bringing out the flavours in what would otherwise be a bland dish. Black pepper, Worcestershire sauce and even HP Sauce can be used to spice things up a little, or else try nutmeg, allspice, or cardamom. 1. Heat the dripping or oil in a pan, and then add a layer of onion and allow them to sweat on a low heat for a few minutes, until they’re nicely cooked through and transparent-looking. 2. Then add a layer of the meat and allow the heat and fat to rise up and start browning it (don’t worry that it won’t cook properly – the water/stock will effectively broil the meat). 3. Add the potato and repeat the layering as much as you want or need. 4. Season to taste and then add as much stock or water to cover the layers and simmer on a medium-low heat – a good few hours is best. Put a lid on the pan to retain as much of the water as possible. Remove the lid for the last half hour or so and give the stovies a gentle prod and try to mush the potatoes up a little to give the juices a good stodgy texture; if you like it really mushy you can mash it gently. 5. 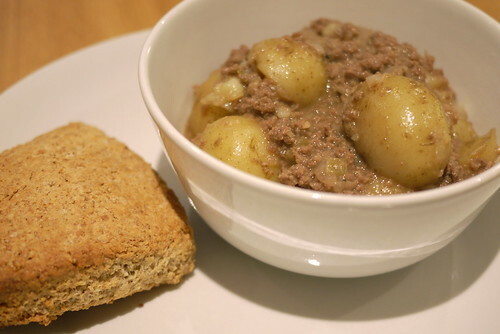 Stovies are usually eaten as a meal on their own, but can be served with cabbage or kail makes if you prefer. The Brodick bannocks are a perfect accompaniment to soak up the juices, but the Fife bannocks work just as well if you don’t like the idea of sweet bannocks with a savoury dish. McNeill’s instructions are quite vague in terms of some of the quantities needed, so really this is something you can make according to your own tastes, and it might need some experimenting with. I’ve modernised the amounts given, where specified, but other than that the instructions are unchanged – I would imagine that most people won’t need nearly as much as those suggested by McNeill, unless your sharing a toast with a whole village! 1. Put the half gallon of ale and the grated nutmeg on the heat and bring it to boiling point, being careful not to overheat. 2. Mix some cold ale with the sugar to sweeten it, and then mix in the beaten eggs. 3. Slowly add the hot ale into the mixture, being careful not to pour too much in at once (otherwise the eggs will curdle). 4. Now pour in the whisky and put the pan back on the heat again, until the mixture is nearly at boiling point again. 5. Take the pan off the heat, pour and serve with a good toast. “Procure a quantity of sids (the inner husks of the oats) from the miller. Put this into a wooden tub or jar (the sowans-bowie) and cover well with lukewarm water. Using a wooden spoon, press down the sides that rise to the surface, and leave for about a week, or up to tend days in cold weather, till they are quite sour. Empty the contents of the bowie into a sowans-sye or sieve placed over another vessel, squeezing the sids by hand to get all the goodness out of them. (This process is called ‘the syeing o the so’ans.) Throw out the sids for the hens to peck at, let the liquid stand for two days longer to allow the starchy matter to sink to the bottom. When required, pour the clear liquid off the top and put some of the sediment into a flagon or wide-mouthed jar standing in a pan of boiling water. Add warm water gradually until it is of the consistency of cream. Cook gently for about ten minutes. Add a little salt, sweeten to taste with heather honey or treacle, and lace with whisky. 1 McNeill, The Scots Kitchen, 1929, p200. 2 McNeill, The Scots Kitchen, 1929, p200. 3 McNeill, Hallowe’en, 1971, p53-54. 4 McNeill, The Silver Bough, Volume 3, 1961, p41. 5 McNeill, The Silver Bough, Volume 3, 1961, p34. 6 McNeill, The Scots Kitchen, 1929, p200. 7 McNeill, The Scots Kitchen, 1929, p200. 8 McNeill, The Silver Bough, Volume 3, 1961, p34. 9 Fairweather, Highland Heritage, 1984, p55. 10 McNeill, The Scots Cellar, 1992, p216.